This year, World Read Aloud Day is on February 1st. Thanks to a growing list of partners and sponsors, this global holiday has reached hundreds of thousands of kids and their parents and teachers in over 100 countries. In 2018, the advent of technology in the classroom—seen as a novel innovation only a few years ago—has become commonplace in many schools, and it's changing the way we celebrate the joy of reading aloud in a big way. This year, Skype in the Classroom has made it easier than ever to book a virtual author visit to a classroom anywhere on the planet through their website. Make your World Read Aloud Day truly memorable for your students by interacting with a real, live Children's Literature author. 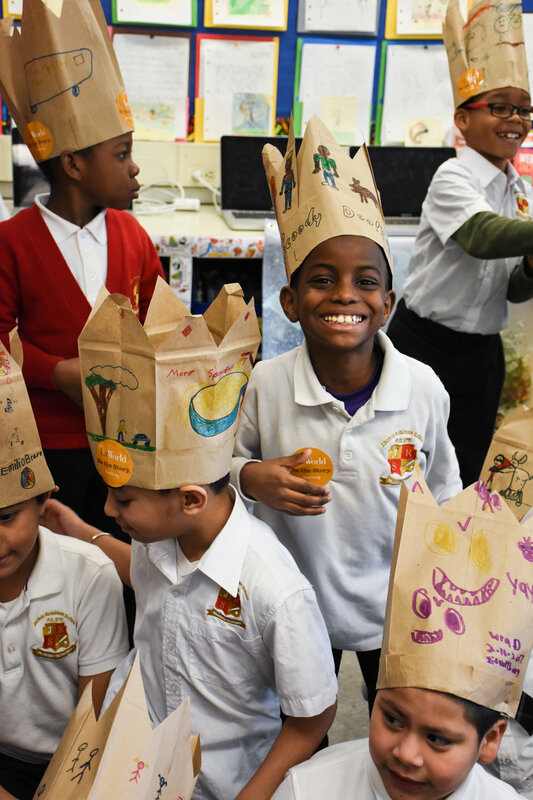 Students in Brooklyn, New York celebrate World Read Aloud Day 2017 by donning their self-made Reading Crowns. Teachers and fans of World Read Aloud Day have banded together to create an expansive, community-run Google Doc, and it is being used to organize cooperative read-aloud events in celebration of the holiday. Introduce your students to a new classroom via the internet, read aloud to each other, ask each other questions, and empower your communities. Tools like video chat and community-built Google Docs have spurred World Read Aloud Day's growth, making it a truly worldwide celebration of community, humanity, storytelling, and joy. For more information and useful resources, visit litworld.org/wrad.